Shar-Pei pups often have a condition called “tight lip syndrome” in which the lower lip pushes against the lower incisor (front) teeth or may even extend to cover those teeth. It is felt by some practitioners that the soft tissue of the lower lip impedes the growth of the lower jaw (mandible) resulting in an underbite. I don’t think that happens as I don’t believe soft tissue can impede bone growth but the lip pressure does cause the lower incisor teeth to angle back towards the mouth and it appears the bite is off. Rarely (I’ve not seen a case) the tight lip can interfere with eating and that is a problem. Two types of surgical repair are available. Surgery usually should be done early – around 3 months of age. One surgery involves resection of the skin of the chin. In this procedure the lower lip is pulled ventrally to expose the lower incisors. When this is done a fold of skin is created on the chin and an elliptical incision is made through the skin and subcutaneous tissue and the fold is removed. 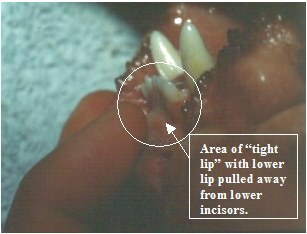 When the subcutaneous tissue and the cut edges of the skin are opposed the lower incisor teeth should remain exposed. A variation of this procedure involves removing a triangular piece of skin from the ventral chin with the base of the triangle parallel to the lower incisors. When the triangle is closed the lower lip is everted. The second procedure is a cheiloplasty procedure. Here the lower lip is separated from the chin so the lip can heal in a more normal position. With the puppy on its back the lower lip is pulled down to expose the lower incisor teeth an incision is made along the mucogingival junction from the first premolar tooth on one side to the first premolar tooth on the other side. The subcutaneous tissue is stripped from the mandible using a periosteal elevator. The tightness of the lip determines the extent of dissection required. The lip should hang just ventral to the mucogingival junction. If it doesn’t, additional length of lip should be dissected from the mandible. No sutures are placed. The owner must run their finger around the created pocket between the lip and mandible daily. This has to be done to prevent the healing tissues from pulling the lip back into normal position. The wound heals by secondary intention healing. Some veterinarians prefer the cheiloplasty procedure over the chin skin resection procedure – they feel the chin skin resection results in decreased flexibility of the skin of the chin, which may prevent normal lengthening of the mandible. Also bear in mind this is a cosmetic surgery and these dogs cannot be shown in the American Kennel Club.